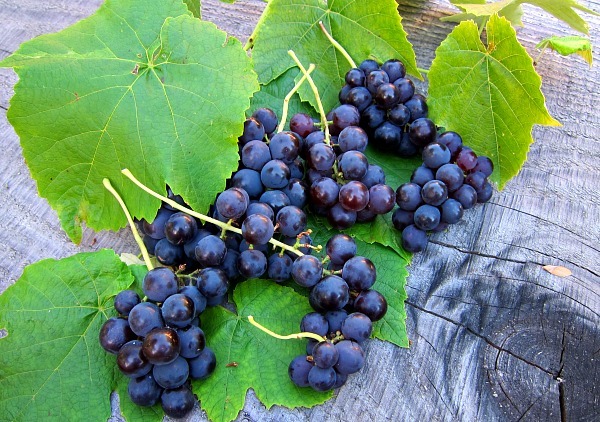 In the beauty pageant of fruit, grapes are certainly one of the more comely and congenial contestants. Colorful, sweet and worldly, grapes garner a place in our hearts rarely shared by other members of proper orchard society. Part rascal, part seductress, my homegrown grapes have me wrapped around their pretty little tendrils. And one I love in particular (aptly named for the Goddess of Love) has my utmost attention and respect: the Venus grape. 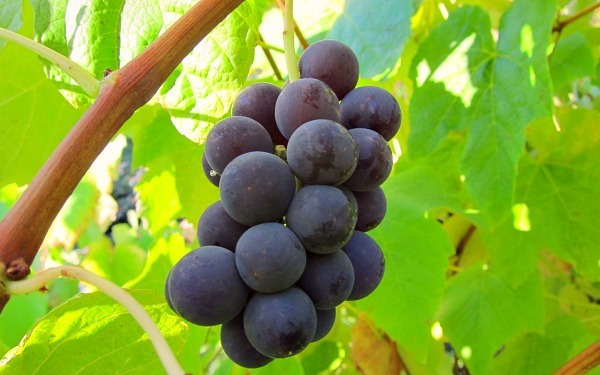 Developed by the University of Arkansas, the Venus grape is a seedless blue-black table or dessert grape with a thickish skin and flavor of labrusca and muscat. In my mini-vineyard, Venus produces fully-formed fruit and ripens well, no small feat in a place where the heat index tops out at sweater-weather. Farm finery: I like to match the fruit I’m harvesting. 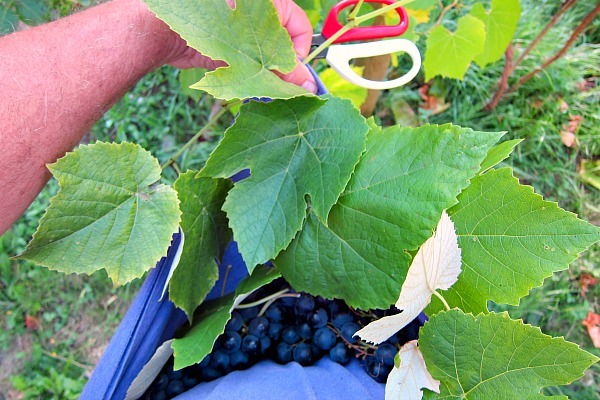 Hidden gems: Venus grapes grow tucked among the leaves, out of sight of birds. Yep, if I only had one table grape to grow in the Pacific Northwest, I’d make it Venus, and if I could add one more, I’d pair it without Glenora grape, which is also a beautifully ornamental vine with dramatic red fall color. Happy growing and good luck! Tom, those look absolutely wonderful. 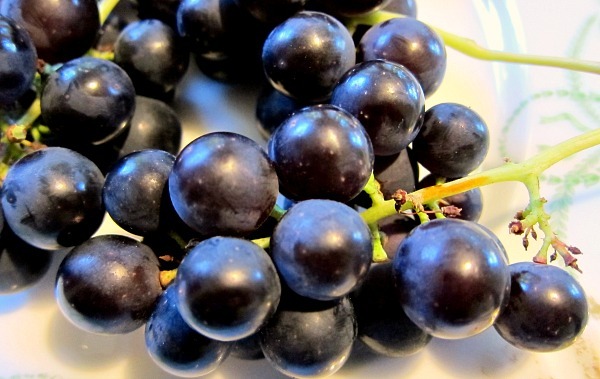 I love eating grapes but rarely know the variety since I have to buy them at the store. You have taught me something I can use when shopping. I will also check with the university extension to see if it’s possible to grow grapes here. Tom…those grapes look scrumptious! Do you know if they do well frozen? I have never had frozen grapes before…but I bet they would be fabulous in a smoothie! My favorite dessert is frozen Venus grapes. They taste as good as any grape popsicle. Great tip Gary. I’ll have to try that out next harvest season. Thank you! Tom, What wonderful grapes! I wish I could get grapes to do well here in NJ. For a couple years now Japanese beatles have been destroying my plants. I put up hanging traps and get gobs of them but not nearly enough before they totally devastate the leaves. Any advice? Hi Amy, I wish I had some good tips on controlling Japanese Beetles, but they don’t inhabit our part of the world, so I’m not much help on that front. As a child, I remember the year we lived in Pennsylvania when our roses were systematically decapitated by legions of Japanese beetles. I’d never seen such destruction from an insect, though in the Northwest we do have equally annoying slugs, but I can at least catch up with them.